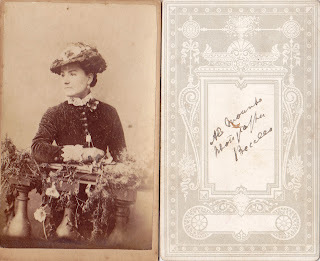 I have a personal interest in Victorian photographers, not least because my ancestors were photographers in the Norfolk market town of Holt, in county Norfolk (see my other blog here), but because my grandmothers were avid family photograph collectors. My maternal grandmother Freda gave me a small collection of photographs several years ago, some of which were taken by Beccles photographers and these have held a special intrigue for me. Therefore, combining my love of local history and old photographs, I have uncovered some interesting information about these Beccles photographers which I thought worthy of writing a blog (or two) about. A E Mount, Smallgate, Photographer: Framed portrait, 2s 6d, Collodion process, colouring. Arthur Mount is the only photographer for Beccles listed in the 1869 Post Office Directory. In fact, the Directory lists Arthur as being an "Artist & Photographer". This doesn't necessarily mean that he was the first and only photographer in Beccles, he was however the only one who advertised his services. By 1874 there was a "rival" photographer on the scene: William Edward Mills (More about him below). Arthur Edgar Mount was born in 1834 in Needham Market, county Suffolk. He was the son of William Mount and Susan, nee Hearn [source: Ancestry.com]. The 1851 census shows Arthur at home, aged 14, with his widowed father. By 1861 he was living in Blyburgate Street, Beccles working as a Photographic Artist and was married to Ellen ( - ). Arthur would go on to marry three times in his life but I do not believe there was ever any children. By 1871 Arthur and Ellen had moved from Blyburgate Street to Station Road, at Sunnyside Villa (also known as Sunnyside House). This would be Arthur's home and photographic studio for many years until his retirement during the 1880s. His wife Ellen died in the June Quarter of 1885 and later that same year, he married Maria/Marian King. According to the 1891 & 1901 census returns, Arthur and his wife were living next door to the Lawrence's of the Beccles Mineral Water Manufacturers. In 1891, Arthur is shown on the census return as a Retired Photographer. By this time there is another photographer in Beccles: Alfred Darby. The 1891-2 White's Directory also lists John Miller, Photographer, of Station Road and Yarmouth. This would indicate that he ran his own studio in Yarmouth and perhaps "freelanced" at Beccles during the period of Arthur Mount's retirement/selling up and the taking on of a new, permanent photographer, which eventually, was Andrew Leyneek (More about Alfred Darby and Andrew Leyneek in part two of this blog). TO BE LET or SOLD: Sunnyside House, Station Road. Apply A E Mount, No 6 Station Road. The 1900 Kelly's Directory lists Arthur E Mount as a Private Resident at Sunnyside House, Station Road. What is interesting about the 1901 census is that it lists Albert C Jervis as living at the same address - Sunnyside Villa, Station Road, working as a Photographer. Arthur had by this time resigned so perhaps Albert Jervis had been his apprentice with a view to taking over the business. It would appear, however, that Albert did not remain in Beccles for very long, moving with his wife and family back to Ipswich. Some time after 1901 Arthur and Marian Mount moved away from Beccles and went to live in Norwich. Arthur's second wife Marian died in the June Quarter of 1905 and later that same year he married Annie Ransome. (As a genealogist I find it rather odd that both of Arthur's first two wives died in the June Quarter of a year and then he married in the December Quarter of that same year. Twice!). Arthur Edgar Mount died on 4 June 1923. He left effects of £60 to Walter Samuel Mollison, a retired photographer. William Edward Mills was born in 1834 in Wrentham, county Suffolk. He was possibly the son of Thomas Mills and Susan. It is not known for certain as the 1841 census is not clear and William was found on the 1851 census return residing as apprentice lodger in Mutford. William did not start out his working life as a Photographer. He was apprenticed to John Pleasants in 1851 and by 1861 was living in North Cove, and was working as a Blacksmith. 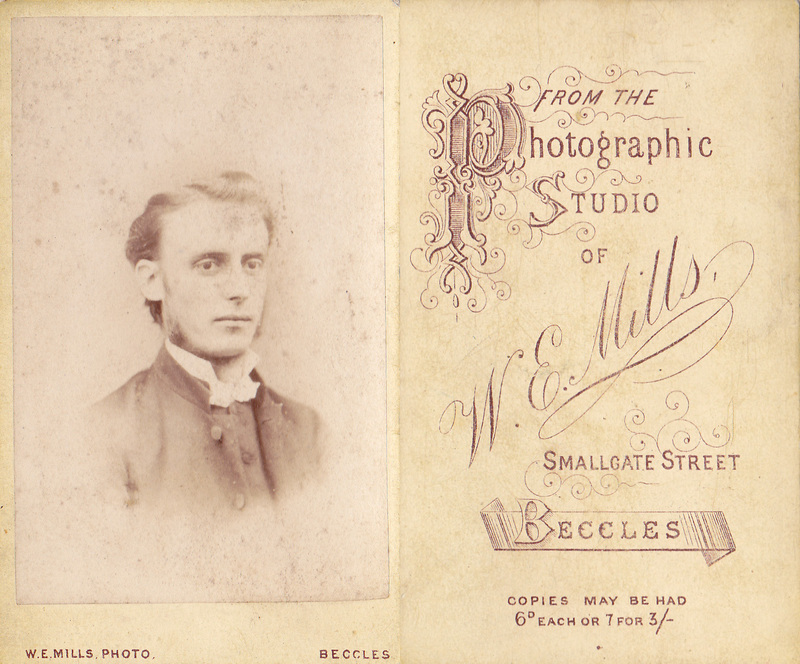 By 1871 however, William was living in Smallgate Street, in Beccles and was trading as a Photographer. He had married Jemima Julians in 1870 but it would appear that, like Arthur Edgar Mount, they did not have children. The 1874 White's Directory lists William Mills, Photographer, of Smallgate Street. Then William's life takes another interesting turn of events when his wife Jemima dies in 1875, aged just 36. The Wesleyan Chapel held a Public Tea in the grounds of Mr Mills' Photographic Studio. Band of Hope: Held in Mr Mills' rooms in Smallgate. Mr T A Laws presided. Then, on the 1881 census return, we find William Mills, still in Smallgate Street, but this time he is listed as a Furniture Dealer. He remained thus until his death on 15 February 1886. He left just over £72 to his widowed sister Emma Mitchell, his only next-of-kin. Today the site and grounds of William Mills and, later, Alfred Darby's, photography studio is the site of the Potters/Friends Meeting House in Beccles. The house/business on the street front is known today as the Quaker Cottage. This is almost certainly where Mills' and Darby's photography studio would have once been. White Studio Photographers - Capture beautiful wedding moments and professional photgraphs and videos in best prices and packages to choose from at White Hat. With our highly professional tam of expert we cover events, editorial assignments, family portraits and much more. 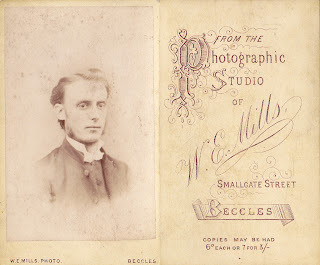 I am interested in your notes on John Miller Photographer of Beccles. 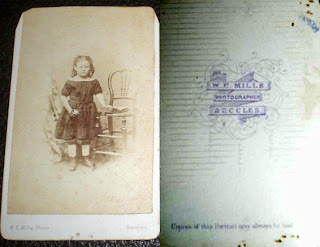 I am researching Great Yarmouth photographers and the Miller family are very much of interest. Some Miller mounts indicate they had studios in Yarmouth and Beccles. The Beccles branch seems to be a part time venture. However there is no member of the Miller family called John. The business was started by Wallace Miller who died in 1883. Mrs Miller later married a John Lockwood and they then traded as Miller's Royal Studio. It's possible that John Miller was really John Lockwood.